Small, brown and wiry, Jayanthi Kuru-Utumpala, stands at no more than 5 feet 1.5 inches in her socks; but to anyone who knows her, she is a formidable force. On May 21, 2016, she proved this fact beyond doubt when she became the first Sri Lankan to summit the mighty Mount Everest. At 8,848 metres above sea level, climbing the Everest is no mean feat; ascent is marked with challenge and is often perilous. First surmounted in 1953 by Kiwi Edmund Hillary and Nepalese Sherpa Tenzing Norgay, the peak claimed seven lives this 2016 season from which Jayanthi and her partner Johann have just returned. Known in the Nepalese vernacular as Sagarmatha and in the Tibetan as Chomolungma, the Everest lies on the Mahalangur Himal section of the Himalayan mountain range alongside three of the Earth’s six highest peaks – Lhotse, Makalu and Cho Oyu. Born in 1979 to Nissanka, a mechanical engineer, and Jacinta, a manager in the hospitality industry, (turned-housewife), Jayanthi was baptized at the ‘Gal Palliya’ in Colpetty - St. Michael’s, Polwatte, and in the Anglican tradition attended Bishop’s College, while her older brother attended S. Thomas College, Mount Lavinia. Oxygen tanks, stacked up in case of an emergency! But how did it all begin? With a photograph, in 2002, Jayanthi said. In Delhi to complete her BA in English Literature, Jayanthi saw the framed photo of a friend surrounded by icy snow in the cold Indian Himalayas, that set her off: “I was like: Oh cool, I want to do that,” she said. And so, the next summer, Jayanthi signed up for the same month-long mountaineering course her friend had taken. “It was like boot camp!” she said, of the experience, explaining that a lot of the people signed up were Indian Military professionals, required to undertake grueling training. “We were a bunch of BA students, with a love for nature, the outdoors, and fooling around,” she said. “We didn’t want to travel at their pace, we wanted to wander around, look at what we saw there, etc.” she said. 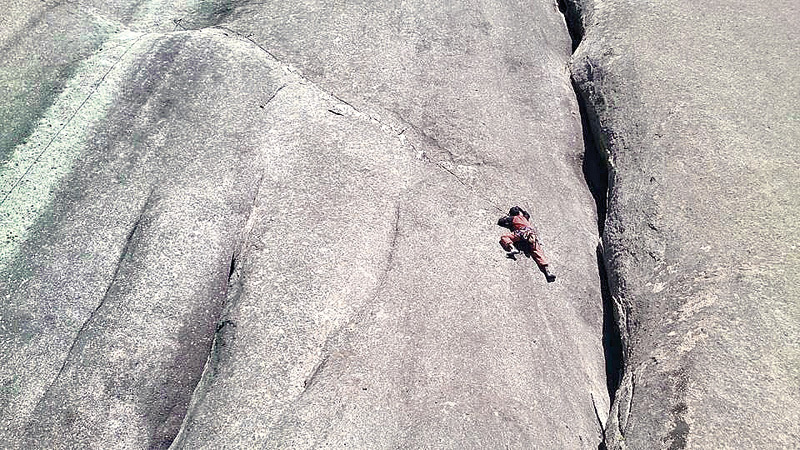 Jayanthi admitted that neither her friends nor she had scaled the 17,000 feet mountain, B.C. Roy Peak, as the weather took a turn for the worse: “But I learned a lot about rock climbing,” she said: “Rock-climbing, ice climbing, survival skills, altitude sickness, how to read the signs of pulmonary or cerebral edema – I learned about all of these important factors on this mountain,” she said. Jayanthi had returned the next year to take the advanced course at the Himalayan Mountaineering Institute (HMI), a decision, according to her mum, Jacinta, not entirely out of character for Jayanthi: “Jayanthi is very perseverant,” she said. “Even with her studies she wasn’t what you would call a ‘studious’ child, especially since she was running around, playing so much sport – tennis, swimming, hockey, you name it! But when the exams came around, Jayanthi was both conscientious and perseverant,” her mother said. Her perseverance is visible in her academic and professional achievements, too. Having earned her undergraduate degree in English Literature from the Delhi University in 2003, Jayanthi won a full scholarship to the University of Sussex, to follow her MA in Gender Studies. This enabled her advance her career at the Women and Media Collective (WMC) – where she had been working since 2003. The WMC is committed to furthering the cause of women in society: The Collective actively engages with key stakeholders on issues relating to the inclusion of women’s rights in legislation or policy reform, and has seen success in the areas of the National Women’s Charter, the National Action Plan for Women, the Migrant Rights Policy and the Domestic Violence Act. Jayanthi followed her 2003 mountaineering experience with several other peaks. In 2011 she scaled Island Peak in the Himalaya, while in 2014, Mt. Kilimanjaro in Tanzania, and went rock climbing at every opportunity including in the Spanish Pyranees, Argentian Andes, South Africa, UK, and Thailand. Locally, she trekked with family and friends and some of her favourites include Kirigalpoththa in Horton Plains, Sinhagala in the Sinharajah Rainforest, Manigala in Knuckles mountain range and Bible Rock. Since 2003 she has also worked as a freelance rock climbing instructor with Borderlands, Sri Lanka, an outdoor adventure and education company, where she taught rock climbing, abseiling, canyoning to aspiring extreme adventure students. But still, the conquest of Everest remained a dream just out of reach. 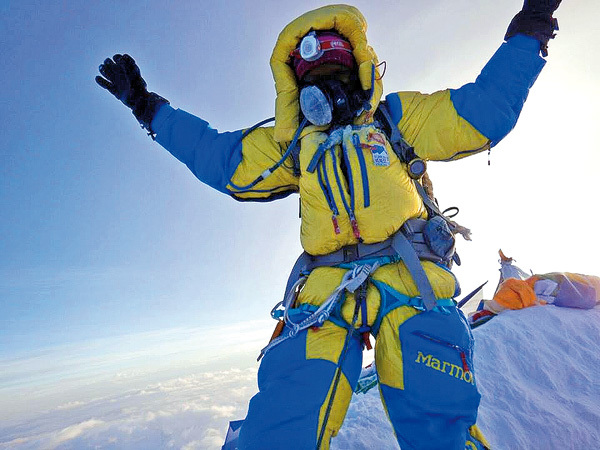 “It was not one of those things you ever expect to actually do," she said and added “Everest existed as a dream, and as a desire.” But in 2011, Jayanthi formally laid plans for the Everest ascent. By then she had met her climbing partner Johann, who had also expressed an interest in summitting Everest, and so, over a period of five years, everything necessary to make this journey, was put in place. She said this had included interval training, which entailed, for example, running up the Piduruthalagala, Kirigalpoththa and Thotupola Kanda peaks, swimming, core strengthening, as well as stretching, doing yoga and cycling. Jayanthi said she had also researched mental strength strategies to prepare her for the extreme physical challenges of scaling Everest. In retrospect, she said, it seemed as though everything she had done in the past, led up to this moment of achievement, when she summited Everest: “It was almost as if fate had a hand in this,” she said, "As though destiny played a role." The Everest expedition cost a whopping USD 136,000 for the two of them. Jayanthi knew that in addition to preparing physically and mentally for the challenge, Johann and she would have to find the money to make the trek. Together with a team of friends who volunteered support, a campaign to crowdfund the expedition on the website indiegogo.com was begun, a Facebook page was set up, and formal fundraising events arranged. Jayanthi said the same thing of the expedition: “We were not sure if we would be able to raise the money needed to make the expedition,” she said. “And right until the last moment, we were not sure we would make it. We had some amazing support at the last stage,” she said. 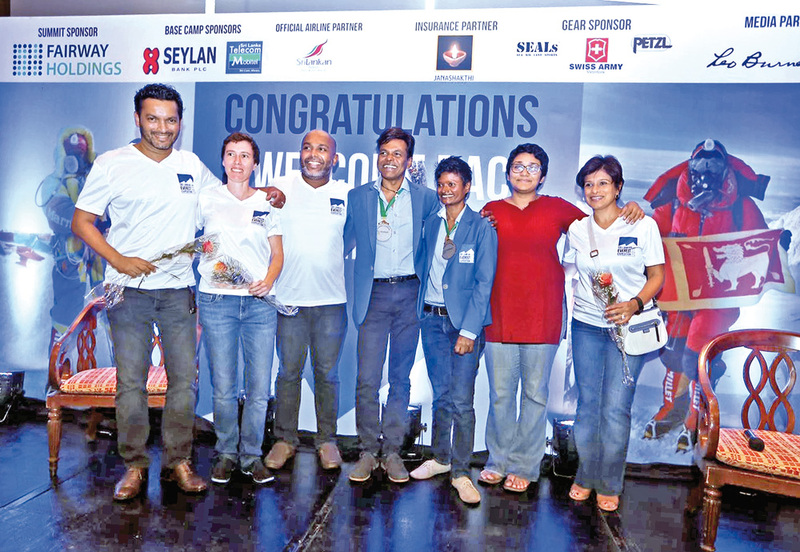 Fairway Holdings, SriLankan Airlines, Seylan Bank, Mobitel, Sri Lanka Telecom, Janashakthi Insurance, SEALS Adventure, and Petzl are some of the bigger corporate entities that came on board to support Jay and Johann on their expedition. Fairway Holdings came in as the summit sponsors. Speaking to the Daily News, Fairway said they chose to support Jayanthi and Johann, because they saw, reflected in the duo, some of the core values at Fairway: “The whole ethos at Fairway is allowing people to live up to their aspirations. When the sponsorship request came in, we saw a good fit with the company’s philosophy; here were two young people attempting something that had not been attempted before, aspiring to change the status quo and reach new heights,” Fairway said. “We are especially happy that this will inspire the future generations. Fairway is not about the present, we are about the future and we have full confidence that many youngsters will take the path that Jayanthi and Johann have done,” they said. She said that at the stage, the message was that Johann was still on his way, ‘so I thought it was also looking good for him. We waited for hours to hear that Johann had also summited, but that message didn’t come through - so we went from feeling absolutely delighted to being gutted that Johann had got so close but not made it,” she said. On the mountain, at the last stages of her ascent Jayanthi says she was conscious mostly of the difficulties: “Everything was difficult,” she said. “Not one thing was easy.” She recalled how it was that she moved sometimes – “two steps, and a stop for breath, two steps, and stop for breath,” she said of that time. “It was freezing. It was beautiful, the landscape was beautiful, but there was also the sense of isolation; there was the spiritual sense of being on your own, up against the elements. “I was not the strongest of the group,” she said. Nor was I the fittest or the fastest. So what was it that got Jayanthi to the top? “Sheer will power,” her sister-in-law Karin proffered. Jayanthi’s mum Jacinta said the same – “Well, she’s proved it now, hasn’t she,” she said, “Just how strong-willed she is.” But for Jayanthi it was different. “This was for the girls,” she said thoughtfully. I did it for us girls.